We travelled from Hobart via overnight stops at Tullah and Waratah then onto Corinna for two nights next to the Pieman River. The route from Hobart followed the Lyell Highway (A10) to Queenstown, onto the Zeehan Highway (A10) to the junction with Anthony Road (B28) and turned right onto a road that continued to the Murchison Highway (A10). At that junction we turned right and continued north to Tullah. From Tullah we travelled north on the Murchison Highway (A10). We turned left onto Waratah Road (B23) for the township of Waratah. To reach Corinna we travelled along the bitumen Waratah Road (B23) to the township/mine of Savage River then continue on this renamed road (which changes to a gravel surface only), Corinna Road (C247). Note: whether on a bitumen or gravel surface, the roads mentioned above on the west coast of Tasmania are two-lane, various degrees of narrow, are perpetually winding and therefore travel is slow, have irregular and infrequent signage about appropriate speeds, may have inconsistent and incomplete line markings on the road, and the road verges are tiny and soft edged and often almost non-existent. In places there are steep drop offs to one side of the road. It is possible to travel with a caravan on all the above mentioned roads, however I have been informed by one couple it was only possible to travel at 30km/hour on Corinna Road (C247) because of the nature of the road. 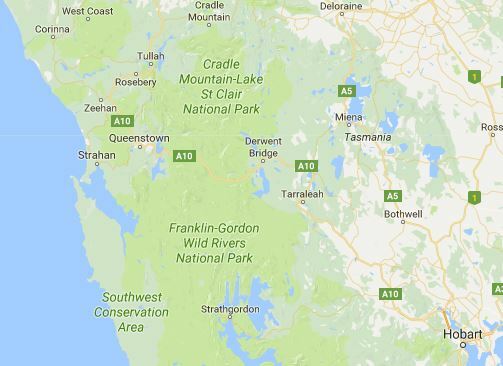 For locals and tourists located in the north western end of Tasmania, the southern Tarkine can be reached from the northern Tarkine via Norfolk Road (C249) also known as the Western Explorer Road/Highway. From the middle coast of the north west, the southern Tarkine can best be accessed either by travelling south along the Mount Hicks Road (B26) from Wynyard then connecting with the Murchison Highway (A10) or by taking the Murchison Highway (A10) from Somerset (slightly west of Burnie). For mainlanders and international tourists, flights from Melbourne land at both Wynyard and Devonport. The Wynyard airport (often referred to as the Burnie airport) is located closest to the Murchison Highway. We plan to travel to and make my own discoveries of the northern Tarkine early in 2018. From Hobart we expect to travel via the Midlands/Heritage highway onto the Bass Highway and then continue to the western end before travelling south along the coast to the Arthur River and beyond.